Bryant is my hometown. I wasn't born there, but I got there as quick as I could at age 15 months. Both of my parents, Leon Garlinger and Donna Moore Garlinger were born in Bryant. I was born in El Paso, Texas in 1951 when my Dad was stationed at Ft. Bliss while serving in the Army. I started elementary school in Bryant and many of my fondest childhood memories are centered there. The first Garlinger's migrated from Hardin County, Ohio and settled in Bryant in the late 1800's. I have had the good fortune of travelling to all 50 states and 69 nations of the world. I have lived other places, but everybody should have a hometown. For me, Bryant, Indiana will always be my hometown. 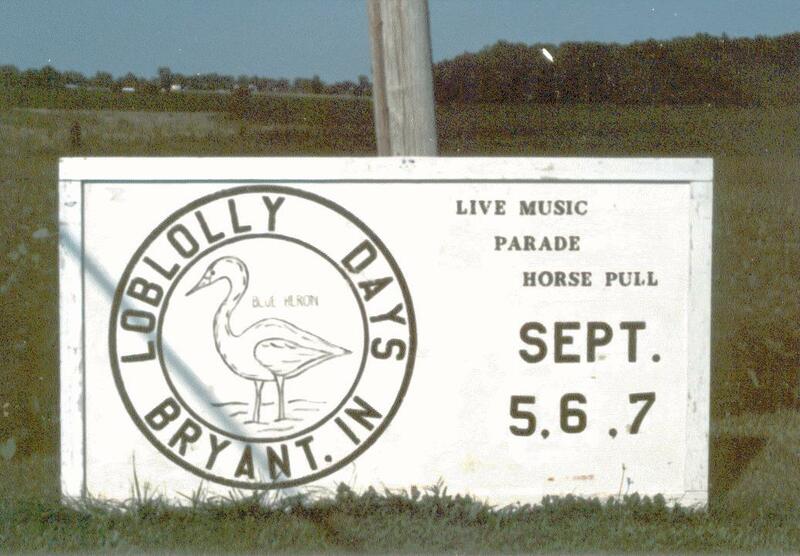 In 1975, Bryant observed its Centennial in a celebration called Bryant Loblolly Days. Every year from 1975 to 1997, my two daughters, Angela, Kelly and I returned to visit their Grandparents and celebrate "Bryant Days". The "loblolly" refers to a swampy marsh that once surrounded much of the area around Bryant. It was made famous in the novels of Gene Stratton Porter at the turn of the 20th-century. She wrote about the Loblolly and Limberlost marshes of Jay and Adams County. This wildlife area was drained many years ago and has served as farmland for many decades. Bryant has honored the Loblolly name as a community get-together each September on the weekend after Labor Day. It is small town America at its best. 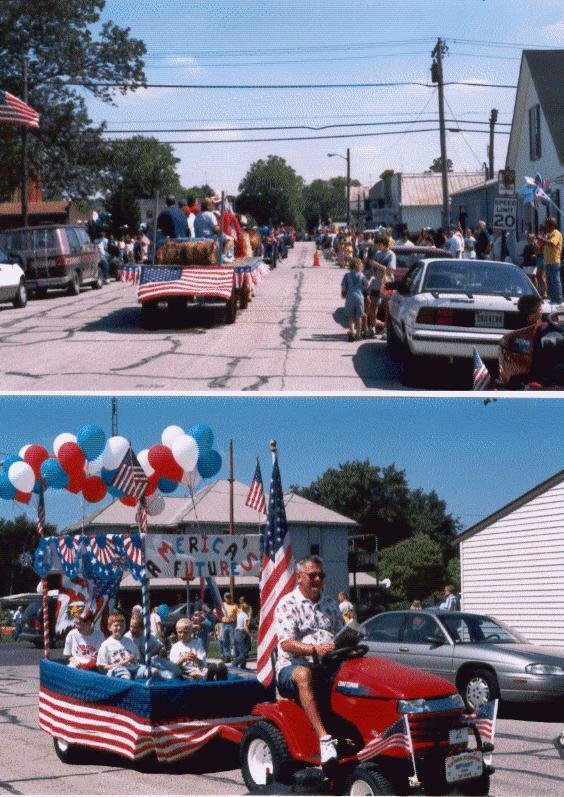 A 30 minute patriotic parade is scheduled on Saturday. There are time tested simple activities that are fun for the whole family. 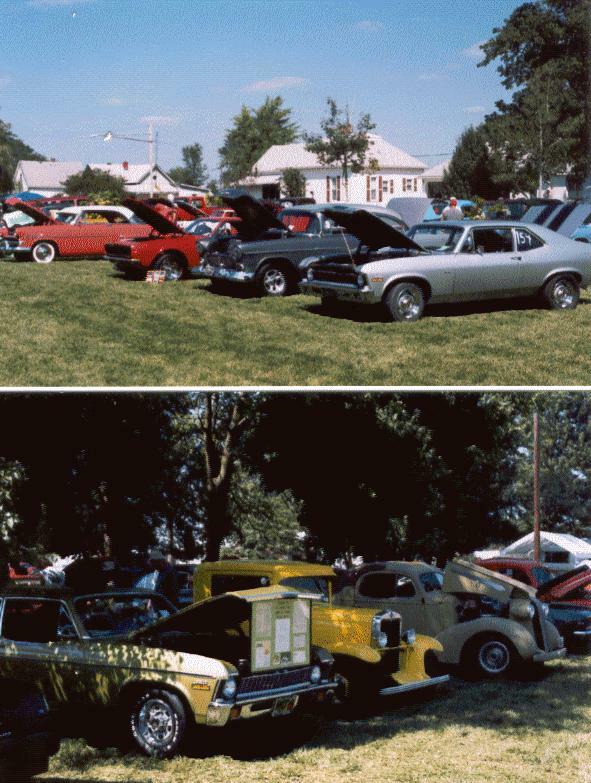 There is a tractor pull, and a horse pull, a talent contest, horseshoe competition, Cow-patty Bingo, a ballon toss, three-legged sack races, dancing, raffles, bingo, lemonade stands and a vintage car show. 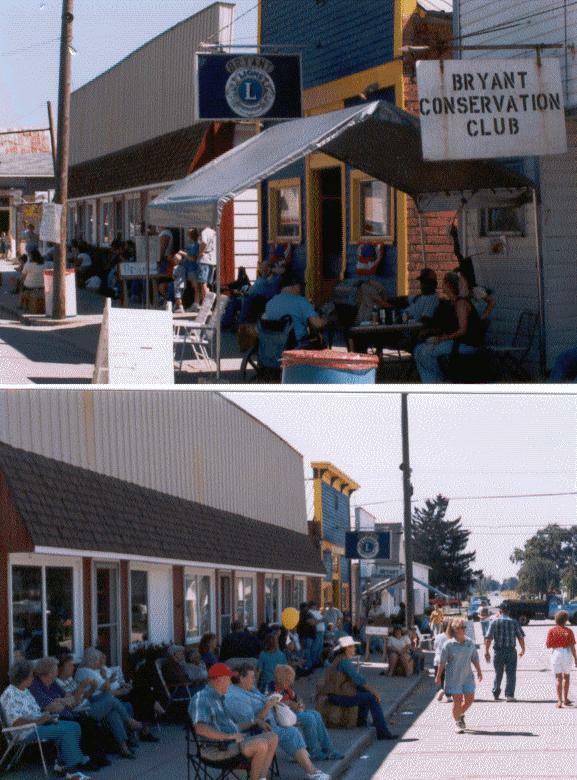 The people line-up with lawn chairs or sit on bales of hay in front of the 100-year-old store fronts on Main Street across from the Bryant Grain Elevator. 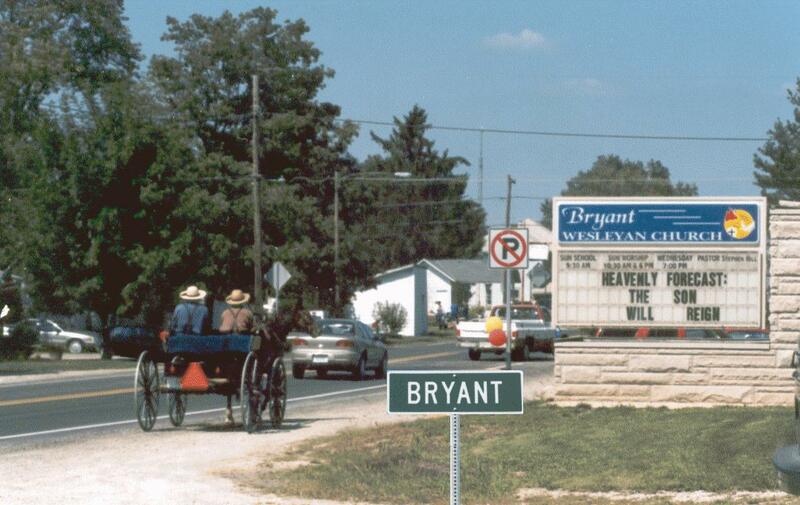 History of My Bryant Bryant is located at the center of Section 17 in Bearcreek Township in Jay County, Indiana. Bryant had its beginning in 1871 as a result of the construction of the Cincinnati, Richmond and Fort Wayne Railroad. This was later known as the Grand Rapids and Indiana Railway (G.R.& I.). It later became part of Penn Central. 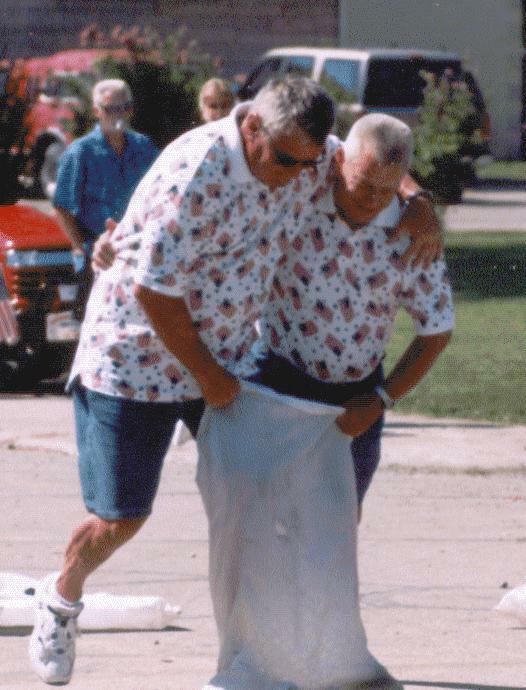 The town was originally known as "Billtown". This was due to four parcels of land that came together at a center point in Bryant. The four landowners were William Kerr Sanders at the Northwest, William Carson at the Northeast, William D. McClellan at the Southeast and William Riley Gillum at the Southwest. On a portion of the land once owned by William Carson stands the oldest house in Bryant at 208 N. Malin (Malire) St. 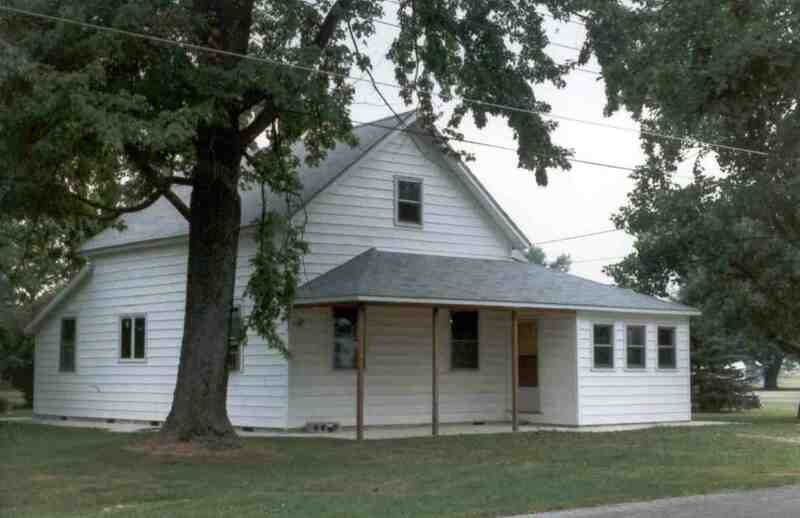 This house on Block 2- Lot 1 was purchased and restored by my parents, Leon and Donna Garlinger in the late 1980's. 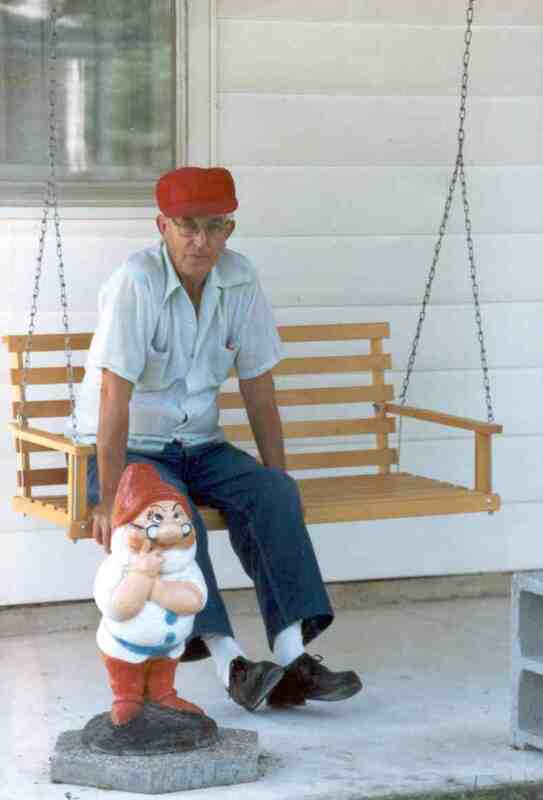 In the last years of his life, my Dad could often be seen sitting on the porch swing of the house he had restored sitting next to "Doc". 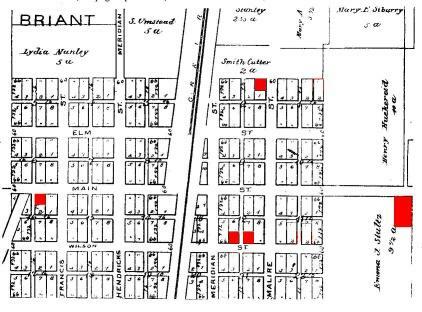 The original plot of Bryant was recorded January 5, 1872 by the four landowners and given the name BRYAN in honor of the Irish construction foreman that laid the railroad. The railroad did not like the name and instead placed the name BRIANT on the rail station, possibly to avoid confusion with Bryan, Ohio. When a U.S. Post Office was established, the town was finally given the name BRYANT. The town was officially incorporated in December 1897. The population in 1887 was 300, it peaked at 465 in 1912, by the time I was born in 1951 it was at 300 again and has hovered a litlle above or below the 300 count for the last 50 years.. It's boom period occurred between 1888 and 1912 after the discovery of gas and oil in the area. In 1912, there were 32 thriving businesses in Bryant. The oil was pumped through pipelines to a refinery in Lima. Ohio. As late as 1980, Gerald Knoelke operated some of the original leases and trucked oil to Ft. Wayne, Indiana. In 1904, the Farmers and Merchants Bank was established at the soutwest corner of Main and Malin Street. Later a brick building was constructed next door for the bank. The old bank building served as the Post Office until a new one was built in 1966. The bank began with capital of $25,000 and by 1922 reported $246,160. When the depression struck the assests dwindled and on June 21, 1930 the bank was declared insolvent. Since that time Bryant has been without a bank. In the early part of the 20th Century, my grandfather Bert Garlinger was a well known local carpenter and brick-layer. He participated in the construction of many of the homes and businesses around Bryant, including laying the bricks for Main Street. His three sons were also carpenters, George, Carl and my father Leon. They worked on many of the homes and businesses in the area up to the early 1960's. 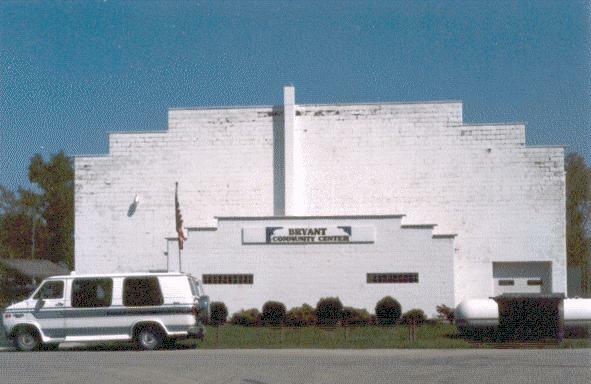 My father helped construct the Bryant High School Gymnasium in the 1950's, that now serves as the Bryant Community Center. The first church in Bryant was the Lutheran Church organized in 1874. The second was in October 1884 and is known today as the Bryant Wesleyan Church. The early history of the Bryant Methodist Church has been lost. We know that the basement was dug in 1913 and the church dedication was in 1914. It was in this church basement in 1955, at the age of four, that I have my first recollections of Sunday School. I distinctly remember the class singing "Onward Christian Soldiers" in the basement of the Bryant Methodist Church.. This simple childhood memory stuck with me. Thirty years later I tapped that memory for use in broadcasts heard around the world. In 1985, I had the unique privilege of constructing Indiana's only International Shortwave Broadcast station near Noblesville, Indiana. WHRI is a Christian radio station that uses "Onward Christian Soldiers" for its identification signal in broadcasts to Europe and South America. 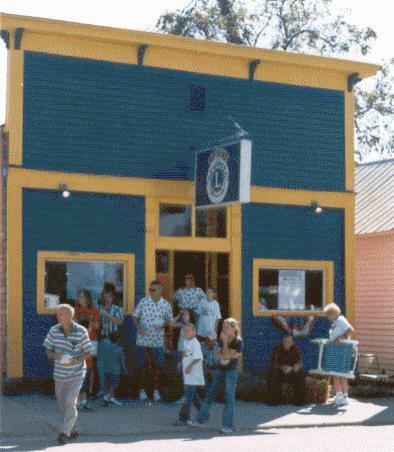 Later, KWHR in Naalehu, Hawaii and WHRA in Greenbush, Maine were constructed and use the same "Onward Christian Soldiers" for identification in their broadcasts to the Middle East, Africa, Asia and Australia. As a young boy we lived in a brown shingled house (left) on the southeast side of Bryant on Wilson street. It was directly across the alley from my Grandmother, Emma Knoelke Garlinger's house (center). Living that close to your Grandma is a good thing when you're that young. In 1957, when I was 6, my Dad built a small two-bedroom blockhouse on West Main Street (right). I remember helping mix the concrete and pulling my little red wagon down to Fred Montgomery's Gulf station to get cokes and Eskimo Pies. Our first Christmas in the block house we didn't have money for a Christmas tree. Just before Christmas break, my first grade teacher, Mrs. Orr, asked the class if there was anyone who did not have a Christmast tree and wanted to take the one that had been used in the classroom. Two hands shot up, mine was first. When I got home, my Dad was too proud to accept the tree and wouldn't let me have it. I still remember the other boy dragging the tree home in the snow. The next Christmas, my Dad got a small 4' tree from somewhere and we had a Christmas tree setting on a table that year. After Christmas, my Dad planted it next to the front step of the our new block house. Thirty years later the tree could still be seen dwarfing the house and served as a nostalgic reminder of my time in Bryant so many years ago. 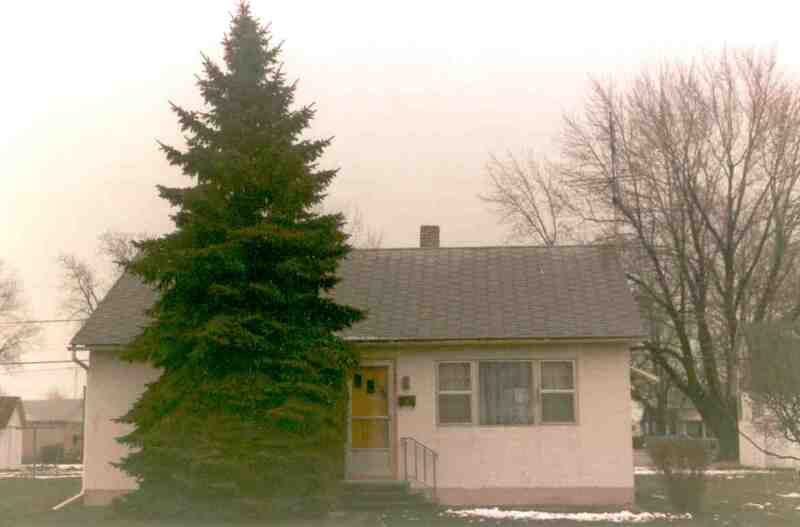 Sometime in the late 1990's the tree had grown so huge, the owners of the house cut it down when they re-modeled the house. 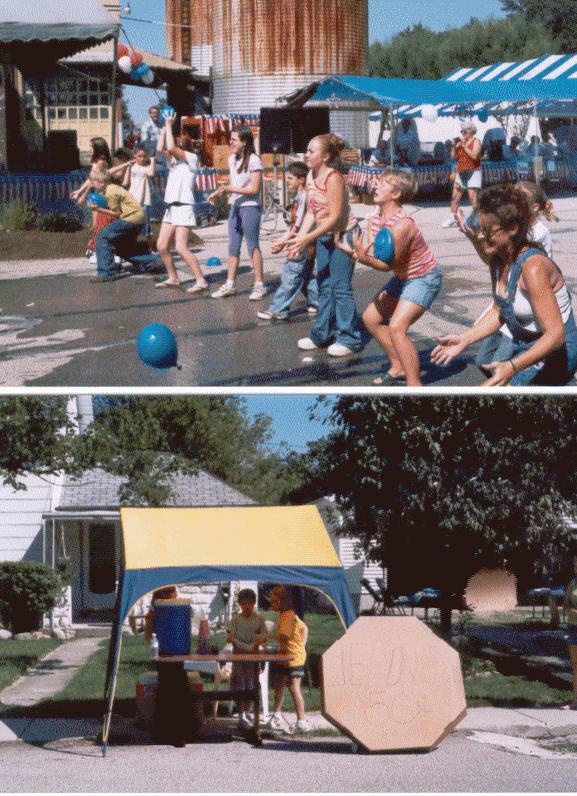 These are just a few of the memories that I have of the Bryant I lived in so long ago. The unofficial historian for Bryant History is Mrs. Gladys Ketchum. 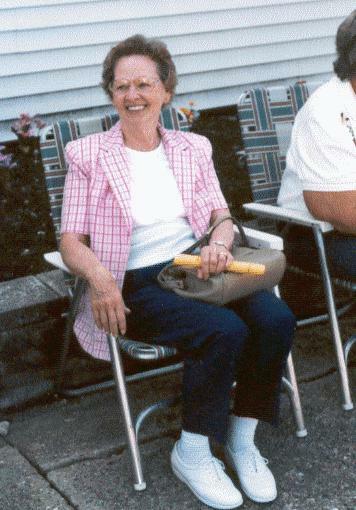 She was the Home Economics teacher for 41 years at Bryant High School. 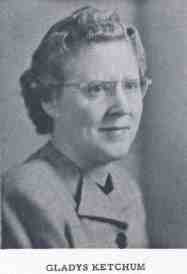 She taught my mother in the late 1940's. She has put together several articles related to Bryant. She prepared the Bryant Area Centennial book in 1975 which contains much information about Bryant History and she contributed an article to the Jay County Sesquicentennial book in 1986. The following files can be downloaded as an Adobe PDF file. A very comprehensive history of Bryant and information about some Families that lived in Bryant. This is a very large 16 MB file and should only be downloaded if you have DSL or a high speed modem.